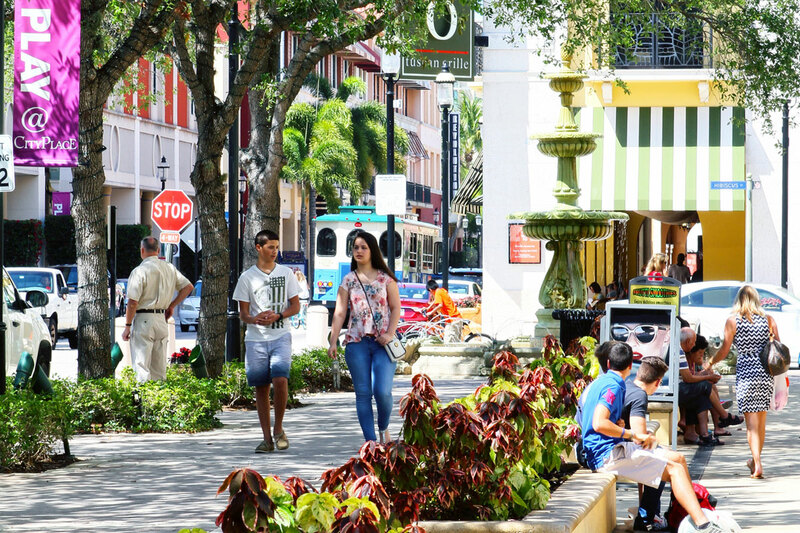 The City of West Palm Beach authored its first book and while it is a great marketing tool to reach investors, developers and business owners interested in forming a business relationship, “West Palm Beach: a City on the Move” is also about us—its people. Sometimes all it takes to re-center and refresh your mind and body is taking a walk to the waterfront and staring off into the tranquil Lake Worth Lagoon. If that doesn’t energize you, perhaps the city’s vibrant and urban vibe will. West Palm Beach is a city on the move, and the people who live and work here are the engine that powers it. West Palm Beach Mayor Jeri Muoio views a new book entitled “West Palm Beach: a City on the Move,” as a great way to tell our story. The book’s title offers a picture of the future, and we are not the only ones to think we are flourishing. The City is ranked in the Top 20 on the Forbes “America’s Fastest-Growing Cities” 2017 list and Top 40 on their “The Best Places for Business & Careers” 2017 list. Flashforward to June 2018. Beautiful, revealing, positive, and cool. In the City’s big-hearted debut coffee table book, “West Palm Beach: a City on the Move,” everything is growing and expanding for a city that was born on November 5, 1894, after 78 people met at the “Calaboose,” the first jail and police station located at Clematis Street and Dixie Highway. Published by Star Group International, the book’s theme carries that clear message: the city’s got a lifestyle and pace that people love, especially millennials. Who should read it? Everyone, everyone. The book is a collection of highlights of our city—from lifestyle to business, to community to people, to education and the arts, to history, wonders of nature, and culture—that still conjures that feeling of being on the move. The story is about a city known for its delectable desire for being first. First city in the world to have a 600 ton, 35-foot sand holiday tree. First city in America to have a privately owned, operated, and maintained an express intercity higher-speed rail system [Brightline] in the United States. 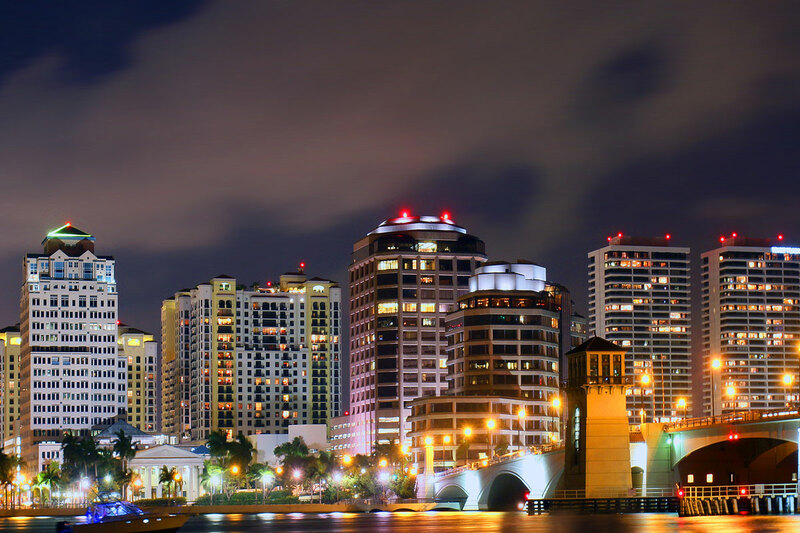 First city in the State of Florida to earn the distinction of 4-STAR city, and one of only twenty-four local governments in the nation to receive a 4- or 5-STAR certification. When Brenda Star of Star Group International approached Mayor Muoio about this project, the Mayor loved the idea of a book about West Palm Beach. She wanted to show what a beautiful place it is, and all the cool things that are going on. So, she jumped on board. What this book flawlessly reveals is that West Palm Beach is a diverse, urban center. And while the city can definitely be admired for its amazing natural and historical beauty, as well as its cultural diversity, it is not this perceived notion that some people may have of our city: a never-never land filled with gated communities, fancy cars and picture perfect weather all year, like a scene from “The Stepford Wives,” a science fiction film based on the novel by Ira Levin about a quiet Connecticut suburb. At some point in the future, the book is going to be available at the Visitor Center in downtown West Palm Beach. The City has published 2,000 books, with plans to give those away, and to later do a second run. Already, the Mayor has received many requests for a copy. She remembered one in particular from a man who used to live here in West Palm Beach, and had to move away, though he didn’t want to. “I really miss the city, I’d love to get a copy of the book,” he told the Mayor, and she sent him a copy. As more people hear about our city they’ll be interested to find out more. As any good book does, it opens a gateway for curiosity and discovery as it shows what a cool place West Palm Beach is and how is growing every day. A great example is the new construction happening on the old City Hall site of 3.5 acres at Banyan Boulevard and Second Street. 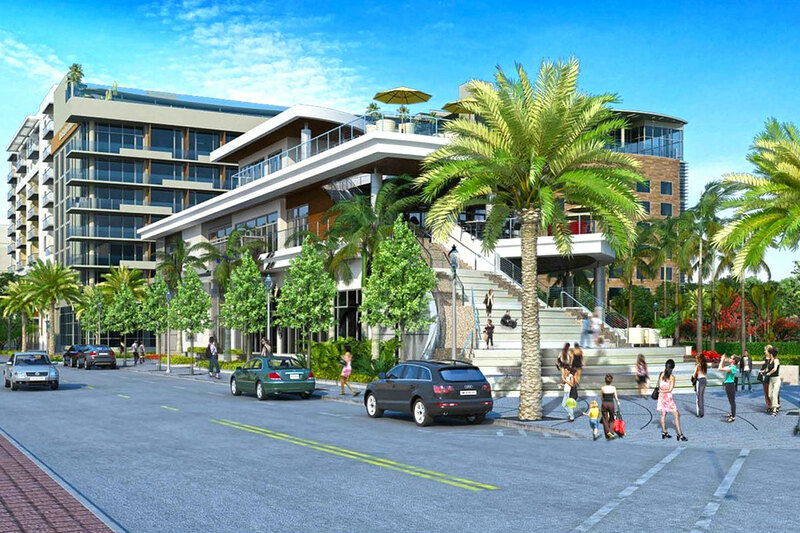 Rendering image for the mixed-use project that is under construction in the site of West Palm Beach’s old city hall. / Photo courtesy of Navarro Lowrey, Inc.
On March 28, after two years of competition and negotiations between the City and some of its citizens, architect and developer Frank Navarro, managing principal of Navarro Lowrey, Inc., bought the West Palm Beach old City Hall paving the way for a $145 million project with a waterfront hotel, apartments and restaurants. Plans for the site, under construction now and to be completed by 2019, are a 208-room Marriott Autograph Collection hotel, 251 live-work apartments, 20,234 square feet of retail space, 6,000 to 7,000 square feet of waterfront restaurant space with indoor and outdoor dining, a 483-space parking garage, a public park with outdoor art, an event lawn and a 3,000-square-foot observation deck 42-feet high, allowing with views of the marina and Intracoastal Waterway. Destined to be a city on the move, every project, every event, everything our City does is the opposite of the “little sleepy town” that perhaps people knew years ago when their grandpa and grandma lived here, and they came to visit during Easter break. “West Palm Beach: a City on the Move” is a spot-on, insightful book about a city and its people. It’s vibrant in every sense: readable, picturesque, inspiring, with all the expectations of perhaps a second book down the road? I can so picture it. 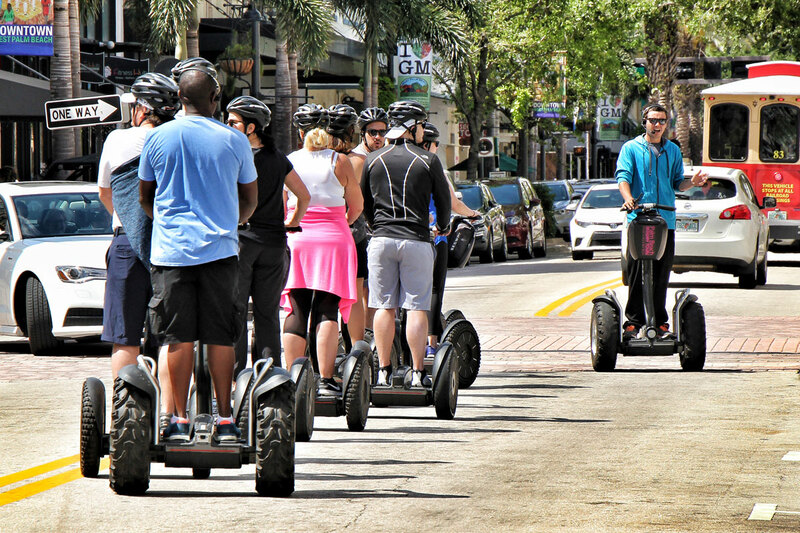 A recording or recollects of people living and working in 2020’s West Palm Beach.